Storage is often a big part of moving and understanding your options is key. A big part of deciding what type of storage you need can be from the “WHY” you need storage in the first place! The housing market is crazy and buying or selling your home can be a bit of a rollercoaster. Whether you have to declutter to sell, put things in storage because your closing to buy was delayed or any other combination of real estate related storage needs! Decide whether you need climate controlled or not, decide if on-site will work, or opt to collaborate with a moving company to secure storage and moving services together. Circling back to the crazy housing market, many folks are opting to stay in place and remodel to accommodate their needs. Remodeling can require work space and that requires storage! Putting items in storage during your remodel can be a great way to clear space and get things done. Check out our list of restrictions for things you can’t put in storage, and get started planning! Downsizing is often associated with seniors and adults that are moving from a large home to a more manageable and smaller living scenario. However, trends for minimalist living and “tiny house” trends are also common cause for downsizing! Why downsize and have to say goodbye? Put your belongings in storage! Couples are often associated with moving in together and combining households. In addition to couples, new roommates, blended families and busy professionals are all moving in together and this can require storage space for extra items. From big furniture and appliances, to clothes, decor and more – Storage can be a great long or short term option. Job and professional opportunities are also evolving and it’s not uncommon for individuals to take short term or even “long term” yet temporary employment assignments. Even if you aren’t moving across town or across the country, temporarily relocating for work may require some storage. Traffic on I-77 North is notorious for delays during the summer season, particularly as it relates to the borders of Virginia and West Virginia and the mountain tunnels. This gridlock back up can add literal hours onto your trip. While it’s a simple merge to single lane, the amount of traffic bottlenecks at warp speed and can mean you and your family sit for hours. Speaking from experience, it’s almost wise to ALWAYS avoid this area on a trip back up North. Our drivers prefer the detour options and play it safe! Avoid the traffic on I-77 North by taking this alternate route! – As you approach the merger of I-77 and I-81, take exit 32 to merge onto I-81 North toward Roanoke. – 16.5 miles later, take exit 98 for VA-100 North toward Dublin/Pearisburg. – Take Route 100 North for almost 25 miles (through Pearisburg). – Keep left at the fork towards US 460 West. – In 23 miles, turn right to re-enter I-77 North. 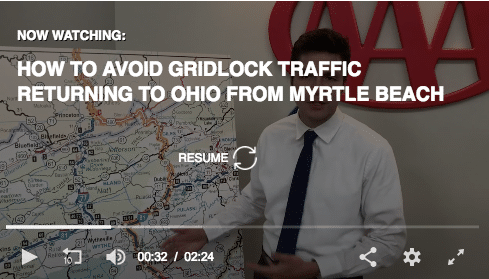 If you’re heading North returning home from a great trip to say North Carolina, South Carolina, etc – And you don’t take the detour, you may end up seriously stuck in traffic on I-77 North. If you decide to risk it, here are some tips! Use Technology – Apple Maps, Waze and other great traffic technology is at our fingertips. Check before your trip and do some research and proactive planning. If there’s a chance you’re going to get stuck – Skip it and take the detour! Get off the freeway – If you’ve decided not to heed the warnings and end up getting stuck, our drivers recommend getting off the highway. If for nothing else than a chance to stock up, gas up, etc. it can save at least a little sanity! Stock Up – Ensure you have ample water, food, gas etc. Pay Attention – Stop and go gridlock traffic can be riddled with accidents. Drivers not paying attention can cause chain accidents that are very difficult for emergency responders to get to. Pay attention! Travel safe out there this summer! Renting a truck vs. hiring movers can be a tough decision, particularly if you aren’t taking all of the variables into consideration! We often receive requests for rental truck driving services and moving labor services. While some customers can benefit from one or the other, many of our customers find that hiring movers to complete their entire move is the best option! A DIY move will typically consist of renting a truck (U Haul, Penske, Budget, etc) and coordinating all loading and packing services, and then unloading services at your destination. Instead of hiring multiple people to handle this, why not consolidate in one!? There is more organization and accountability, and often the cost is LESS in the long run! Understanding all that goes into a move, particularly a long distance move, goes a long way to understanding the costs involved. $40,000 cargo insurance incase anything catastrophic happens on the road. The ability to make your move stress free and enjoyable! When you need help moving, hiring labor help and then a driver is often only a small amount less than just hiring full service movers to complete the entire move! 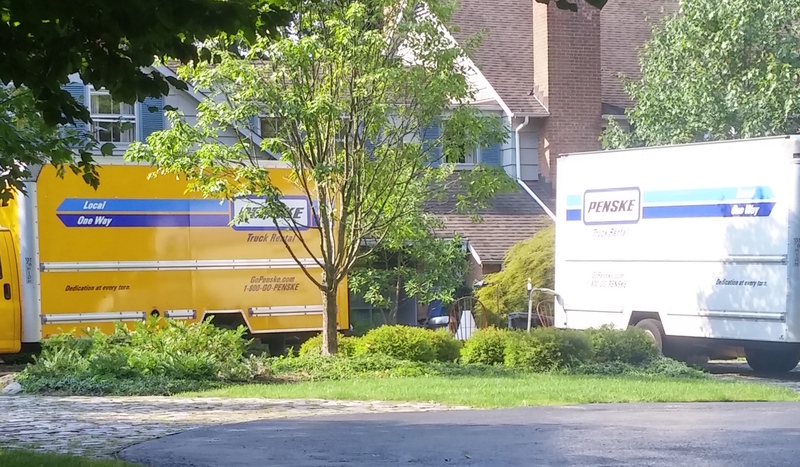 If you are thinking of the pros and cons of renting a truck vs. hiring movers give us a call! Let’s talk about your move and figure out what the best solution is. Start with a free quote here! Winter moving tips can go a long way if you are planning a move in the coming months (gulp, yes, we still may have months left). 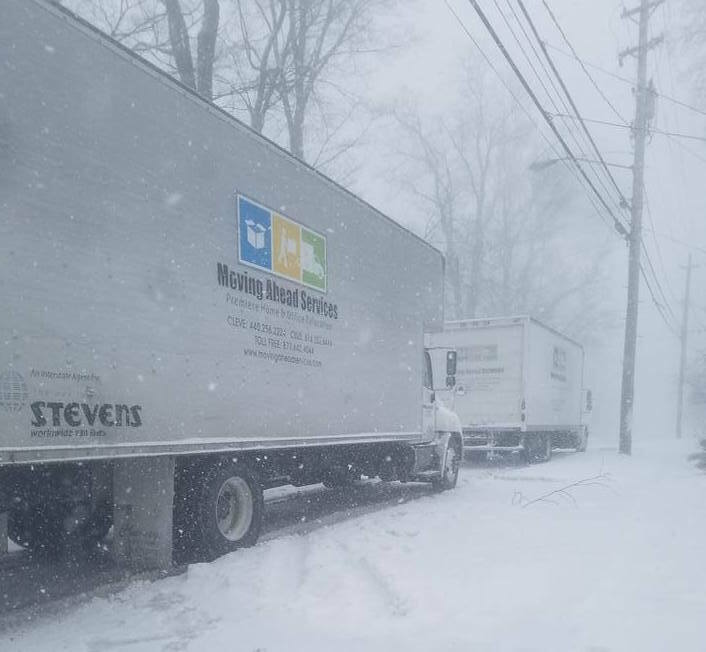 The cold weather is no surprise here in Ohio, and a little extra planning can go a long way for having a great moving day. Check out our 5 tips, straight from the pros themselves. This is a no-brainer. It has to be at the top of the tip list, because it is so critical to a successful moving day. The weather can be unpredictable, but keep an eye on the forecast in the days leading up to your move. Depending on the weather conditions, travel time and general packing / loading time can increase if the weather is not cooperating. Try to have a very flexible schedule on the day of your move, and even factor in an extra day into your timeline. If you’re closing on selling your house, it’s not a good idea to wait until the last day and be buried in the snow when it’s time to hand over the keys! Depending on whether you DIY or hire movers, winter means extra supplies are needed. Assuming you’re choosing the latter, some supplies will be provided by your movers and others you will want to plan for. Things that will be your responsibility include salt for pathways, protecting floors, and even ensuring everything is properly packed. Many professional moving companies offer floor protectant and will provide the proper safety gear, including cold weather gear and proper roadside items to indicate the parked truck, etc. Take extra care to have proper clothing and footwear as well! Even if you have hired movers, chances are you’ll be spending at least some time going back and forth form the outside. It’s incredibly important to be prepared on the day of your move if there is snow or ice on the ground. Providing safe working surfaces, including a clear driveway and walk paths, is critical. Not only is the movers’ safety a consideration, but it’s also critical for your items being transported to and from a moving truck! No one wants to slip and fall while carrying a heavy dresser or other furniture. If you’re doing the packing yourself, take extra care to pack items appropriately that may be sensitive to the cold weather temperatures. If your belongings are spending extended time in the back of a moving truck or in a staging area such as a garage, this is incredibly important! Check out our tips on how to pack electronics. Climate controlled storage is essential in the wintertime. Some items may not matter, like clothing or some furniture, but other items cannot spend extended time in a cold storage unit. Some moving companies offer storage (we have an onsite warehouse at each location) or you can select a climate controlled storage unit. Keep in mind, independent storage units can have a wait list for climate control so look early and often! There you have it, our round up of winter moving tips direct from the pros that know! Get a free quote for your winter move, and keep your fingers crossed the ground hog reports in our favor. Moving and cleaning can quickly become overwhelming! Check out our latest post at Allconnect.com and tackle your cleaning tasks like an expert. Download the Infographic here, compliments of Angie’s List! Choosing movers can be overwhelming. It’s helpful to revisit moving and relocation as a whole this time of year, and at the risk of shameless self promotion, we think we are pretty great at what we do! For many, this time of year begins the process of buying or selling, moving and starting over – Whether this is your first move or 10th, whether you are moving across the country or down the street, it’s a nice reminder that choosing movers can be easy! Trusting our family to move yours is more than a tag line at Moving Ahead Services. We truly are family, and many of us have worked together since the early days of the company. From the time of just a dozen employees to present day, Moving Ahead Services has grown over 600% alone in just the last 5 years. That’s pretty impressive! It honestly would not be possible without the best employees, the best processes and the highest standards of service. There is a reason we are #1. We’ve been doing it right for a long time! For over a decade, our company has grown and evolved to do great things, even better than they have ever been done before. We are established and trusted, the exact opposite of a fly-by-night moving company. We know what we are talking about! We are truly experts, and it’s proven by our great feature articles across the web. From the American Moving and Storage Association to business features in Columbus CEO, The News-Herald, Angie’s List and Yelp, our business and practices have been highlighted in articles and news stories across the industry. Moving Ahead Services is an active community member. From Move for Hunger to our partnerships with Susan G. Komen and United Way, Providence House and more – We are committed to making our communities a better place. WE HANDLE ALL YOUR MOVING NEEDS.® And it’s true! 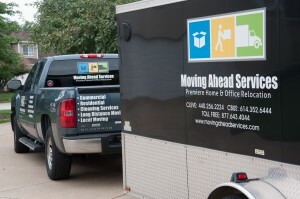 Moving Ahead Services has the most extensive service menu of any private relocation company in Ohio. We provide a wealth of services in house, without expensive outsourcing and no sacrifice of quality. We are an award winning business. Moving Ahead Services was named Willoughby and Western Lake Country Chamber of Commerce Business of the Year, A finalist for Fast Track 50 Emerging Business, Move For Hunger’s 2016 Mover of the Year and a repeated Angie’s List Super Service Top 5% Award Winner. Our customers are really happy. Honestly, we have wonderful feedback across the web! From Angie’s List to the BBB, Facebook, Google and Yelp. Our customers love us! We have thousands of A+ and 5 Star reviews online. It should go without saying, Moving Ahead Services is appropriately licensed and insured. We adhere to extensive hiring practices, including full background screenings. Our continued training initiatives and team growth plans allow us to serve our customers the best way we know how. What are you waiting for? Request your free moving quote online today, or just call to talk with our experts. You won’t be disappointed, and our services will not be beat! March unofficially kicks off the peak season here at Moving Ahead Services! While the busiest months are typically from June – September, March sees an increase in moves coming out of the holidays and early start to the year. For many, this can mean your move may need to take some special timeline considerations in mind! Keep your moving plans on track and get settled in this Spring. During true peak season, it may be necessary to plan as far as 4-6 weeks in advance of your move. From right now until June, our pros suggest gathering quotes and scheduling 2-3 weeks ahead of your planned moving date if possible. This can allow you to get your preferred moving date and time, despite the increase in moving activity across the industry. Unforeseen changes may make this difficult, but don’t hesitate to call our experts – We will find a way! Keep in mind this time of year moving plans can quickly see changes in the weather, as well as run into holiday travel and school vacations. Easter weekend may see an influx in traffic on the roads, and school breaks for kids can mean increased travel and plans as well. The increase in travel may make taking time off of work difficult, and ultimately make your move stressful! While long weekends and school vacation days can be a great time to move, it can also complicate your plans. Our dedicated planning team will help you choose a date that fits your schedule and your timeline. Start with your free moving quote online, or call us direct! 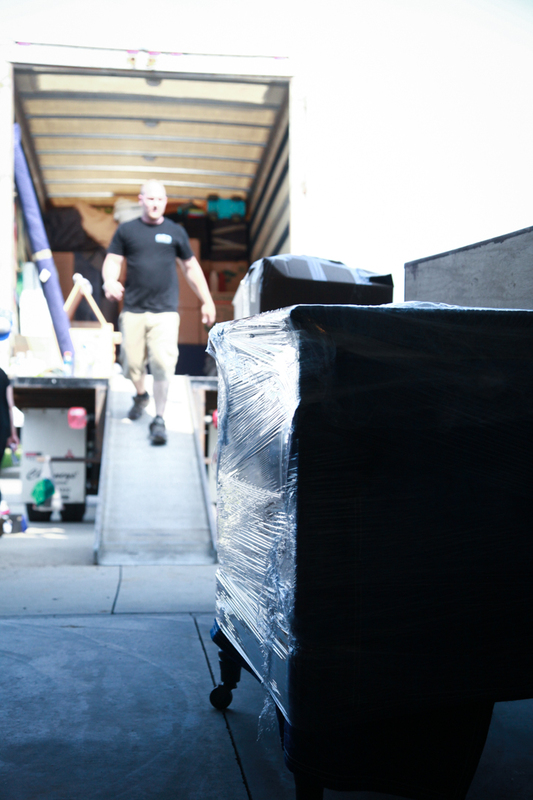 Moving is an exciting time, and having the experts on your side ensures you can enjoy the experience. 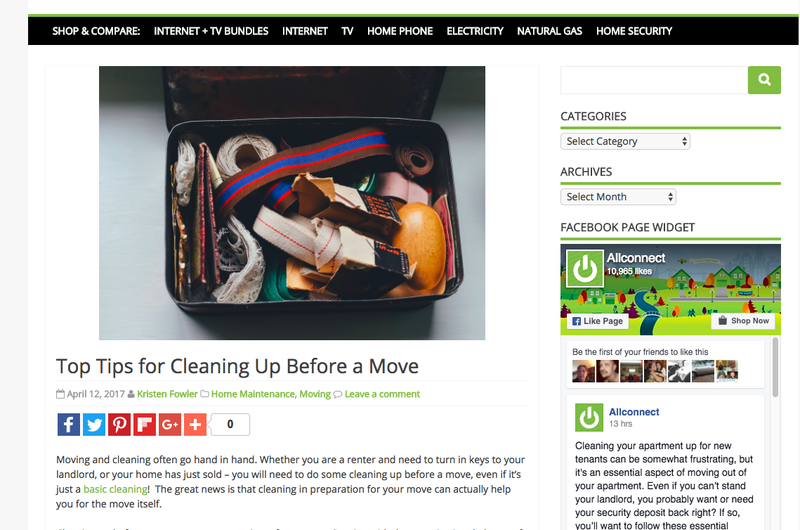 Don’t let the cleaning chores sneak up on your during your move plans! Whether you plan to hire pros or DIY – our cleaning experts at Moving Ahead teamed up with Angie’s List to share a move cleaning checklist! Check out some great insider tips below, or view and download the full checklist here. Why plan for cleaning before, during and after your move? Whether you are renting and need to give your keys back to a landlord – Or your home is selling – Cleaning is likely a part of the deal. The final transfer in a sale will likely include the house be cleaned, and in a renting scenario, your landlord can refund part or none of your security deposit depending on their discretion. Don’t lose out! Move related cleaning is not as easy as everyone thinks. While it seems with nothing to clean around the tasks should go fast – You have to remember that there is still more to clean! Empty rooms can take awhile, depending on the size and state as well as your regular cleaning habits. Clean any empty rooms follow the move cleaning checklist – so long as you can close the door and are sure they won’t get re-dirtied during or before your move. Clean things that you won’t likely dirty before or during your move! Don’t clean floors and walls yet! These are likely to get dirty before and during your move. After you move your belongings, start on the move cleaning checklist here! Your cleaning supplies are easily kept in a box, and move with you from room to room! Save the floors for the very last. 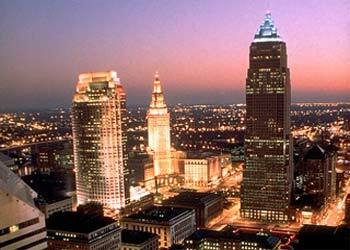 Planning a move in Cleveland? City moving can present with its’ own unique set of challenges if you aren’t sure what to expect or haven’t moved in the recent past. Traffic laws, apartment and street restrictions as well as parking challenges can all have an impact on your moving day! Our experienced Cleveland movers know the drill, and can help make your move easy and affordable. Once you schedule your moving pros, it is important to be sure that you reserve the appropriate considerations for your moving day. In Cleveland, many apartment and condo buildings require the use of freight elevators and reserved parking! Our Cleveland movers will walk you through the planning process to ensure that the day of your move is not riddled with surprises. It is likely that we will need to reserve the elevator and let the property owners know the date of your move so as to reserve adequate parking, preferably near to an entrance. For homes in the Cleveland area, we may need to pre-arrange streetside parking and call in a special request to park on the street when typically it may be restricted. Another important consideration is the distance during your move that the pros will need to carry your household items. If we have to have a staging area, near to an elevator or in another part of the building or even outside, we need to staff appropriately to ensure we have eyes on your treasures 100% of the time! In any city, this can be a deal breaker! We have all seen the news when a semi or box truck strikes a bridge or other type of structure, due to insufficient clearance. Another important consideration for our Cleveland movers is road access and construction! Knowing the area is incredibly important, and successfully planning a route for your move can be the difference in a great day or a disaster. Taking bridges and overpasses, especially in our historic neighborhoods like University, Tremont, Lakewood and Little Italy – into consideration is crucial. Even if you are moving a few miles away, the best route may not be the direct route! 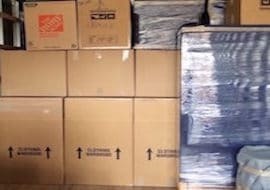 Hire expert Cleveland movers and give yourself peace of mind! Give us a call today to start your moving quote, and begin planning your next move in Cleveland! The Different Types of Moving Estimates and an Explanation of Each! Many types of estimates exist when scheduling and planning your next big move! It is important to understand the differences of each, as well as the information that is required to be provided within the state of Ohio by the PUCO (Public Utilities Commission of Ohio). A Non-Binding Written Estimate: When planning your move, it is common that a representative of the moving company will complete a visual inspection of the items that you will be moving. This is the basis for the non-binding written estimate, and if a fee is assessed for the inspection, then that fee is applied toward your final bill if the move is completed. It is also possible to waive the inspection, and you can do so by indicating on the estimate itself when signing. A Binding Written Estimate: Your chosen moving company cannot exceed the amount that was stated in your moving estimate. A Guaranteed-not-to-Exceed Written Estimate: Specifies the highest amount that can be charged for your move. All moving estimates will include information such as the moving service provider’s full contact information, PUCO number, and the date of your estimate. In addition, your name and contact information, as well as your acceptance signature, is also a part of every completed estimate. Other information, such as your destination(s), payment process, dates, and any items that are damaged or broken prior to services being provided, is also a part of the estimate. Mileage, weight, any storage costs, deposit information, and the type of insurance coverage chosen for your goods are also included. An oral estimate should only ever be given if the total cost for your move is less that $500, or for short-notice moves that may take place in less than five days of you contacting a moving company. Any additional services that you may add require an agreed upon addendum, and not an oral estimate, regardless of the add-on value. Knowing what to expect for your next move is key! Do the necessary research and select a company that follows the proper procedures for operation. Get start with a free moving estimate today!